Software Testing is a very remarkable job profile in the current business market as the development of mobile applications and software for business processes has a great scope. However, not everyone from IT field believes they can pursue the job profile due to many myths associated such as it being boring, offers less pay and respect as compared to developers and it quite complex. However, none of these myths is correct and if anyone really wishes to make a career in software testing, all they require is a rigorous and reliable training from an established training institute. 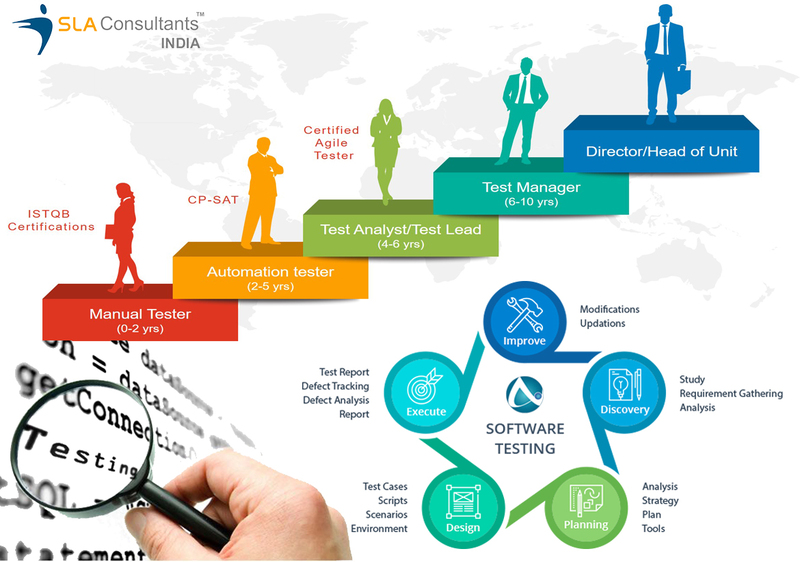 SLA Consultants India is a leading Software Testing Training Institute situated in New Delhi and Gurgaon, offering the most prominent and job oriented training to potential candidates. What exactly is Software Testing? Software testing refers to quality assurance testing performed on developed applications to find out any errors in the program before launching it in the market or submitting to the client. It also allows the development company to identify the areas which need improvement in the software and if it is meeting the requirements of the client. This increases the chances of acceptance from the customer side and promotes more sales. There are several skills that are required to become a professional software tester. In order to find out if you possess some of these skills or has the tendency to develop them in a certain period of time, then compare them from below mentioned skill sets. Problem-solving skills: The main task of software testing is to identify the issue in the developed program and find out the best course of action to resolve them. Through this skill, you will be able to categorize the software system into smaller parts and verify each part separately to identify the main area of the issue by developing test cases. Strong technical skills: It goes without saying that to be a software tester, technical and programming skills are compulsory with knowledge on MS Office, database, programming languages, QTP, LoadRunner, etc. Ability to work in tight schedules: Software testing is one of the last development processes of building a software, and thus, it is necessary that the tester perform their duties within time and with accuracy so that company can submit the program on its schedule. Time management and organizational skills are one of the most important skills required by a software tester. Proper attitude and behaviour: A software tester also requires to communicate and interact with programmers and senior project managers to provide necessary details regarding the program, ask questions and offer recommendations. This could be done by having some brilliant listening skills, communication skills and proper attitude. He or she should not feel stressed or enmity towards others who tells them their mistakes. They should be willing to learn their mistakes and work extra to overcome them. This enhances the supervision and leadership skills in the person. To become a software tester, one should hold a graduate degree in IT field, especially in BCA, MCA, B-Tech, Bsc-IT and another related field. Candidates with certification in software testing from reputed training institutes can also become a software tester. Salary offered to a software tester varies from one company to another. In India, remuneration generally starts from 2.5 Lakh per annum and goes way beyond to 5 Lakh. They are also entitled to incentives, bonuses, health insurance and other additional benefits. The growth opportunity in the field is quite good as a software tester working with a software development firm for over 5 years can be promoted to Sr. Quality analyst. Other major promotions include QA Team Coordinator, Test Manager, and Senior Test Manager after achieving great experience in the field. Performance Testing: Verifying the performance of the application that includes load time, LoadRunner, response time, etc. Business Analyst: By gaining business knowledge, they can also become a business analyst and perform duties such as developing business models, workflows, making suggestions related to technology adoption, etc. Automation Testing: One can also become an automation test engineer where they will automate test cases to save time in execution using IBM Rational Robot tool, QTP and Silk Performer tool. If, by learning about this knowledge on software testing, you are willing to pursue the career in same, then visit SLA Consultants India and attend our renowned and job oriented software testing course.